So enough of the woe is me talk. Let's have some fun. 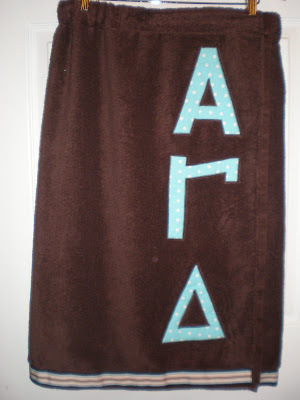 I made these towel wraps as gifts this summer and think they are just as cute as they come. Not to mention useful. They have elastic in the back to fit everyone. And a long Velcro closure for easy use. Want one? Do my sweet friends need a little treat? I thought so too! Here's the deal. Pick any three letter. Or just one or two if you prefer. They may be English letters or Greek letters. They may be your monogram or your daughter's sorority or your neighbor's soon to be monogram. It's up to you. It could be for you. Or used as a gift. Word on the street is that Christmas is creeping up on us. You may also pick two colors. But I will pick everything else- the details are up to me. The rules are easy. Simply leave a comment with your two colors and the letters in correct order. If you want to use Greek letters, please spell them out (so don't say "A", say Alpha). If you do not have a blog, your email must be included in your comment. That's it. Nothing else is required of you. Just because y'all are fabulous and treats are fun. Giveaway is open until Sunday at noon. adorable! 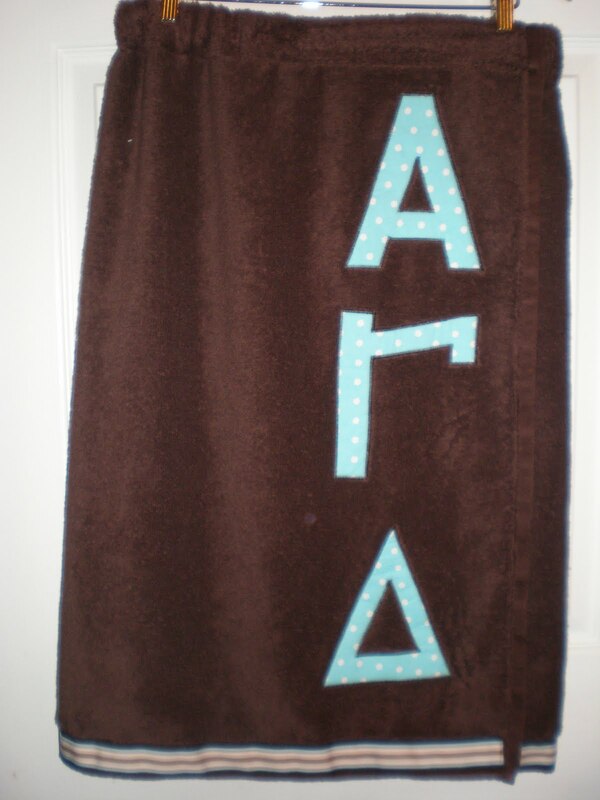 my colors lately have been light bright blue and orange... and of course, i'd want Alpha Gamma Delta! Too cute! I'm going to say AWS as the letters and lime green and navy blue as the colors. Very cute! I love these things. My initials are MRM and my favorite colors are pink and green. Too cute! Sign me up! I would be purple and sage/lime-ish green. My colors are maroon and white ick! So I would axe that for pink and green duh! My letters are Gamma Sigma Simga! These are just too cute!!! I would love on in DG colors - pink and blue and the letters Delta Gamma! Pink and green of course! Or...just the letter A :O) Either or is fine with me! What a great idea, thank you! I have always wanted to own one of these so here goes my attempt to try and finally have one. My color choices would be navy blue and pink. Would love to see just an A for the letter choice. Adorable! I love white and pink and AEN. This is so cute and would be really useful. I'd pick a pink and green wrap with my initials, PAS. You are very kind - I'm inspired to spread some happiness tonight! I'd love something green and white with Alpha Chi Omega. Woo AXO!! Adorable! I would choose the colors pink and navy. Epsilon Sigma Alpha for my letters, please. ooOOoo, a would love one! Her favorite colors right now are pink and spring green, and we'd love Add on it! I love it! I would have to go with my initials (ACH). And dark blue is my favorite color...I'll leave the accent color up to you (OK, anything but orange, how about that?)! You're too sweet, they are soo cute. Pink and Brown...our wedding colors. Super Cute!! What a great giveaway!! My colors are pink and green with the letters Z, O, and E :). Thank you!!! I have been so busy and haven't returned your email yet, but I am planning to today! Thanks so much for emailing me! I would so love to win this giveaway! My colors would be pink and green of course! I would like to get my my future married initials that I am getting in June...JSC. What a great giveaway! I always love to see the things you create! It inspires me so much! I wish I were as talented as you! Super cute! From one sorority girl to another...Dark Blue/Light Blue with Kappa Kappa Gamma! Azure blue & white...Alpha Delta Pi. Have a fabulous weekend! Thanks for the giveaway! Adorable!! Love these. 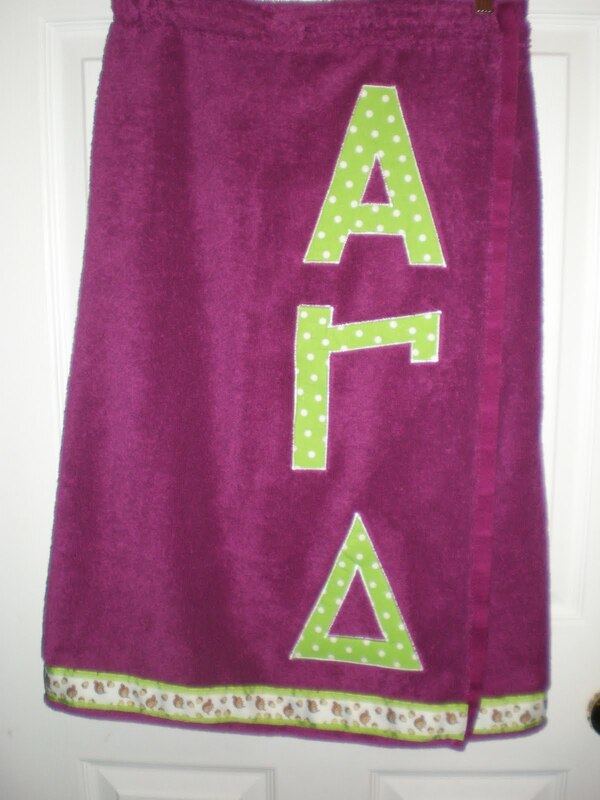 Since I was an Alpha Gamma Delta girl myself I love that but since college has been a few years ago now I would probablly go with my initials LSW and of course pink and green. Oh my gosh, these are darling! My sister is an Alpha Chi Omega. And she obviously loves pink and green! If you choose me, I'm giving it to her as a birthday gift. I would love a red with white letters! This is great! Thank you! Sigma Alpha Iota would be great! I hope this isn't posting multiple times b/c I can't get this posting to work for me! polinsky@cox.netOh! My daughter would love this. She has a monogrammed towel that she adores and i've talking to her about saying goodbye to it because it's seen better days. She loves all greens and her initials are HPP. I'd love pink and green letters that say Phi Mu!! !